Devan Shimoyama ’14MFA was profiled last week in NBC News. The article focused on Shimoyama’s current exhibition at the De Buck Gallery in New York City. This exhibition, which is entitled “Sweet” and is the artist’s first solo show, analyzes the gendered space of the black barbershop. 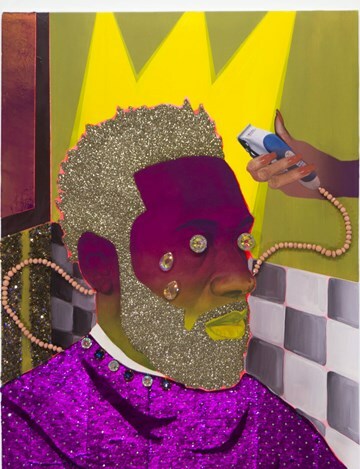 Shimoyama explains, “The black barbershop is not quite [a safe space] for gay black men or women, as it is hyper-masculine and heteronormative and at times homophobic.” His artwork seeks to tackle this paradigm, and create an representation of the barbershop that inclusive of all identities. Find more of Shimoyama’s work here.